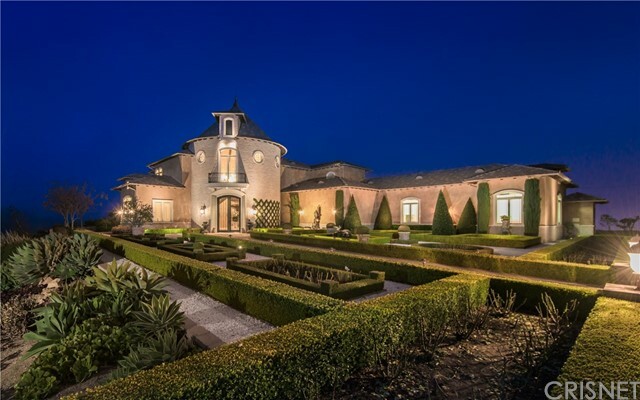 All Westlake Village homes currently listed for sale in Westlake Village as of 04/20/2019 are shown below. You can change the search criteria at any time by pressing the 'Change Search' button below. If you have any questions or you would like more information about any Westlake Village homes for sale or other Westlake Village real estate, please contact us and one of our knowledgeable Westlake Village REALTORS® would be pleased to assist you. "World class French Romantic masterpiece! Truly one of California's most distinct properties. Privately gate guarded 33 acre compound reimagined from the ground up with no expense spared. Enter past a majestic 1/4 acre lake & authentic mill house,formal gardens,stone bridges & four cascading pools inspired by the Monet Gardens of Giverny, France. The main residence spans over 32,000 SF and is graced with 360 degree views & every conceivable amenity imaginable. Features incl. a one of a kind sound proof Dolby certified cinema with 20'x10' screen. There is also an amazing collectors museum, 5000 SF grand master suite & more. The resort grounds provide an 11,000 SF guest hse, working 5 acre organic farm, 2644 SF pool house/spa, two pools & 2 municipal quality wells. Call for much more info." "Set against a true storybook backdrop, the White Stallion Manor is a true personification of enchantment. Situated on nearly 24 acres of sprawling grounds and panoramic scenery, this elegant European Chateau is immaculately finished with every detail accounted on a sophisticated level of custom craft. Nearly 13,000 square feet of luxury lined living. The grand entry opens to a fairytale double staircase with soaring scale. Incredible flooring detail throughout. An incredible kitchen and family room set against the best of Hidden Valley views. There is a luxurious private office quarters, a media room, gym, staff quarters, and 7 large ensuite bedrooms. The Master wing is presidential with it s own living room, dressing and preparation room, and private office. A beautifully detailed master spa with endless panoramic views. Incredible 6 car garage with high stack doors, a dramatic entry with circular motor court behind private gates. An exclusive trophy property for the most discerning buyer." "Magnificent Italian masterpiece in guard gated north ranch country club estates! Ideally set on 4.4 acres behind private gates and up a long driveway is this nearly 14,000 square foot villa boasting panoramic views and the utmost in privacy! Interior features include a grand two story entry with tremendous sweeping staircase. There is also a massive 'great room' with imported stone fireplace, custom soaring beamed ceilings and more. In addition there is a bonus/media room, library, gym and a lower level wine cellar and tasting room. The resort quality grounds boast a custom pool, formal gardens, fountains, covered outdoor dining room, outdoor kitchen with pizza oven and some of the most impressive views imaginable. Other amenities include a 6 car garage with a circular motor court, mahogany doors, hand carved custom cabinetry, and exquisite finishes throughout. Absolutely breathtaking!" "Located in the prestigious private community of North Ranch Country Club Estates, this Mediterranean inspired home is a luxurious yet comfortable home defined by a wealth of spectacular custom design elements. The approx. 15,835 sq. ft. 6 bedroom, 11 bathrooms estate that sits on 4.3 acres includes a family room, living room, formal dining room, a spectacular 2 level library with impressive architectural detailing, a playroom, indoor racquet ball court / basketball court, a subterranean temperature controlled wine room, & an impressive two-level theater/game room. The magnificent rear grounds are completely private & serene, offering a variety of distinctive & separate areas to enjoy a vacation-like escape; including a tropical lagoon with a cascading waterfall & 120' slide, pool house,full tennis court with a viewing pavilion, streams, lounging terraces, two fully equipped grilling/kitchen stations with a pizza oven. An extraordinary property!" "MODERN ARCHITECTURAL DREAM ESTATE MASTERFULLY DESIGNED WITH AN INNOVATIVE BLEND OF TIMELESS ELEGANCE AND WARM SOPHISTICATION PERCHED ON A PRIVATE KNOLL Of NEARLY 6 ACRES OVERLOOKING A 280 DEGREE VISTA OF SERENE MOUNTAINS AND VALLEYS. A PRIVATE, GATED DRIVE LEADS TO THIS 8160 SQ FT, 7 BEDROOM, 8 1/2 BATH MARVEL OF SOARING CEILINGS, INVITING SITING AREAS AND WALLS OF GLASS THAT SEAMLESSLY OPEN TO BRING THE OUTDOORS IN AND EXPAND THE OPEN FLOOR PLAN TO ANOTHER DIMENSION OF ENTERTAINING . THIS SMART HOME HAS BREATHTAKING VIEWS FROM EVERY ANGLE OF ITS UNRIVALED FLOOR PLAN, BLENDING THE LIVING ROOM, FORMAL DINING AREA, SOPHISTICATED BAR WITH THE FOLCUL DUAL SIDED FIREPLACE AND THE EUROPEAN IMPORTED CHEF'S KITCHEN WITH ITS CUSTOM FRIDGE AND HIDEAWAY PANTRY OF MILKY GLASS CABINETS AND STATE OF THE ART APPLIANCES. THE MASTER SUITE SOARS TO PERFECTION WITH UNOBSTRUCTED VIEWS, SERENE SITTING AREA, YOGA-MESSAGE AREA, OVERSIZED HIS AND HERS WALK-IN CLOSETS, AND SUMPTUOUS MASTER BATH FINISHED IN ITALIAN LIMESTONE WITH SOAKING TUB, AND STEAM SHOWER. 5 ADDITIONAL EN-SUITE BEDROOMS COMPLETE THE FIRST LEVEL WITH A PRIVATE GUEST SUITE UPSTAIRS. THE OUTSIDE RIVALS THE INTERIOR WITH A COVERED LOGGIA AND FIREPLACE, INFINITY EDGE POOL AND SPA THAT WRAPS AROUND TO AN OUTDOOR KITCHEN, BBQ, FIRE PIT , OUTDOOR SHOWER, POOL BATH AND BASKETBALL COURT. A MUST SEE FOR THE MOST DISCERNING BUYER." 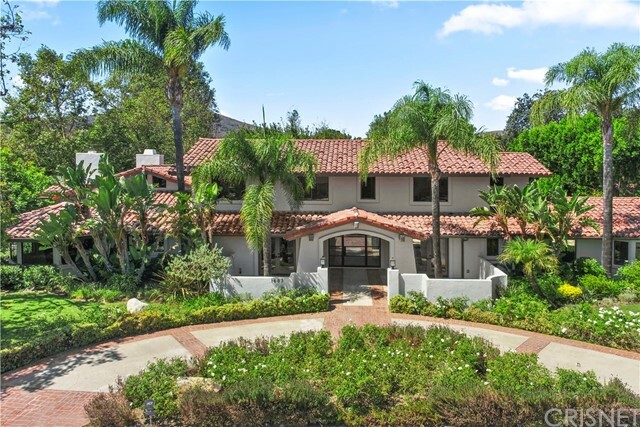 "MAGNIFICENT MEDITERRANEAN COMPOUND in guard-gated North-Ranch Country Club Estates atop a private 3+ acre knoll with city, mountain & golf course views offers nearly 10,000 SF including 7 bedrooms, 10 baths, detached pool house & casita. Lovely courtyard entry, stunning grand foyer; oversized great rm with 25-foot ceilings, massive fp & wet bar; huge formal dining room; chef's kitchen & breakfast rm. Master suite with sitting rm, fp, walk-in closet, lavish bathroom & gym plus 5 additional en-suite bedrooms & playroom. Unique architectural details include Douglas fir beam ceilings, Brazilian rosewood floors with inlaid travertine, & skylights throughout. Lower level has a state-of-the-art home theatre, elevator & 4-car garage with limo bay. A very special property with endless landscaped gardens, outdoor patios & meandering trail leading to one-of-a-kind lagoon style pool with water slide, baja shelf, grotto & waterfall. An entertainer's paradise offering the ultimate in SoCal living." "Fantastic location overlooking the fairway of the prestigious North Ranch golf course. Located behind the guarded gates of Country Club Estates, this estate feature a dramatic entrance with 28' ceilings, indoor waterfall, wood paneled throughout, formal living room, oversize family room, all bedrooms are en suite. Light and bright throughout to show of the beautiful architectural detail. The park-like grounds include an abundance of mature trees, separate guest-house with its own kitchen, poolside dining area, pool and spa, sports court, and unobstructed views of the golf course and the surrounding mountains." "JUST REMODELED! Situated on 3 acres of manicured gardens, within the exclusive Country Club Estates, this French style estate exudes charm & elegance. Upon entering, you are greeted by an expansive two-story foyer boasting a continuous soaring arched ceiling and a sweeping staircase. This 12128 sq ft home offers grand living spaces, ideal for entertaining, including huge family/game room with easy access to the spacious veranda with a fully equipped BBQ/bar, ideal for al fresco dining, gazebo, jacuzzi and an inviting pool.Enjoy magnificent views from the bright formal living room, large chef's kitchen with new appliances/ breakfast area, formal dining room and charming library with vaulted ceilings.The master suite features a private office, his and hers individual bathrooms, closet space and dressing rooms, with a private patio, spa & stunning views of the golf course and endless canyon views. A further 7 bedrooms, all en-suite complete the architectural brilliance of this unique home"
"First time on the market within the coveted North Ranch Country Club Estates is this highly visible and centrally located seven (7) bedroom, ten (10) bath estate. This property is the centerpiece of this prestigious neighborhood. The majestic estate is reached through private security gates and long driveway. The home sits on a 2.1 acre lot above the Lakes golf course of the North Ranch Country Club which provides a magnificent view of the valley and surrounding mountains. The entire estate is landscaped including lush plantings which give the exterior an English garden motif. The interior includes a dramatic grand entry, a gourmet kitchen with Dacor appliances, a large family room with coffered ceilings which opens to a backyard with an infinity pool complimenting the spectacular vista. The patio also features a large barbeque center, gazebo with a fireplace and television and abundant space for outdoor entertaining. The interior features a gym, sauna and steam, movie theatre, six (6) en-suite bedrooms and an expansive second floor master and secondary bedroom comfortably accessed with an elevator. It is one of the most uniquely designed and premier estates of Westlake Village." "Magnificent Mediterranean Villa ideally set on nearly 2.8 acres in the exclusive guard gated North Ranch Country Club estates! Sensational views and privacy! The grand two story entry opens to nearly 9100 square feet with 7 bedrooms, 7.5 baths, theater, billiard room, library, temp controlled wine closet and a large second story bonus room with closet that is easily used as an 8th bedroom. The tremendous center island kitchen provides a large breakfast room and top of the line appliances. The impressive master suite is graced with a large sitting room, fireplace and massive private balcony to take advantage of the stellar views. The true resort quality grounds boast a vacation style pool and spa, two barbecue centers, sunken covered dining pavilion, pizza oven, zen garden, basketball court, designated children's swingset area, manicured lawns and a tremendous lower level for possible orchard, tennis or sports court. Other amenities include a pool house, five car garage and so much more. A very rare offering!" "Ushered through private gates, discover an expansive estate featuring lush greenery & secret gardens. This estates strong character is attributed to high ceilings, Venetian plaster & luminous skylights. The kitchen alone spans 1,100 square feet, detailed with wood moldings, center island & breakfast nook that overlooks the beach-entry pool. Each bedroom is complete with an en-suite patio & the master suite includes a fitness center & spa, perfect for energy-revival. Enjoy theatrical experiences in the Egyptian style theater with stone walls & leather seating. Relax among outdoor living with a waterfall, sport court, kids playhouse & complete two-story guesthouse. Perfect for invitation-only events, twilight cocktail parties & midnight swims, this estate shines day & night." "This private and gated 6-Acre estate in Westlake boasts one of the most breathtaking unobstructed views of the Santa Monica mountains. Spanning nearly 7,570 Sq. Ft, the floor plan provides media and billiards rooms, gym, office/library, 1000 bottle climate controlled wine cellar, & more. The dramatic center island kitchen opens to the family room with views from every window. All bedrooms, including master suite, are on the 1st level. Built by Wayne Moss, the home provides character and unparalleled quality craftsmanship throughout. Interior appointments include solid wide plank walnut wood floors, natural stone finishes, hand distressed wood beamed ceilings, and wrought iron accents. Outside you'll find meticulously manicured storybook grounds with numerous entertainment spaces. The top level provides a beautiful outdoor fireplace and BBQ area and the lower level provides a guest house, room for a pool and a trail to a small cottage. The potential for expansion is limitless." "Prime location and one of the most private settings in North Ranch Club Estates, offering a blend of Park Avenue and Beverly Hills. Entertain in sophisticated elegance or simply enjoy the casual and relaxing family spaces. with 6 bedrooms, 6.5 baths, set upon approximately 2.19 acres. Impeccable finishes await your most discerning buyer; with the impressive two-story marble entry, state of the art home theater, magnificent living and family rooms complimented by walnut flooring and custom coffered ceilings. A spacious center island with Carrera marble and granite countertops, built-in Miele stainless steel coffee system, Viking stove and Sub-Zero refrigerator/freezer are just a few of the elements you can enjoy in your gourmet kitchen. Other incredible design features include a timeless and inviting office/library with built-ins and a temperature controlled wine room.The backyard was created with entertaining in mind; built-in BBQ center, outdoor fireplace, beach entry Pebble Tec pool & spa, waterfall and waterslide. The yard's total privacy allows for absolute relaxation with access to hiking trails and room for a sports court." "Situated in Hidden Valley Estates, this highly sought after property sits privately behind security gates at the top of a private cul-de-sac. With over 2-acres of privacy and serenity, this 6,350 sq. ft. 5 bedroom and 6.5 bath estate offers Westlake Village living at its finest. Newly upgraded with hand distressed, hardwood flooring, this incredible home offers the finest quality throughout. This expanded and customized home, features thoughtful design situating the main living areas with an outdoor-indoor living experience. Seamlessly connected to the great room, you'll find gourmet kitchen with upgraded top of the line cabinets, stainless Viking appliances. Elegantly designed and full of dimension, the master suite and bath are a perfect retreat. Dual vanity and walk-in closets boast comfort and convenience, and a deep-soak Jacuzzi tub offers total relaxation. Outside, you'll find a magnificent backyard encompassing natural terrain, mountain views, and evocative design aesthetics. A custom-built gazebo with outdoor dining and fireplace, BBQ patio area, swimming pool with waterfalls, spa, putting green, gardens and fountains, make's this space a truly unbelievable entertainer's paradise, newly added 2 car garage with workshop, Gym, 2 bedrooms & 2 Baths"
"Prime location inside the prestigious guard gated North Ranch Country Club Estates. Spanning 8027 square feet is this beautiful custom traditional. Interior features include a grand two story entry, formal library, media/bonus room, center island kitchen and a large family room with custom ceilings, fireplace, wet bar and beautiful wood detailing. There are 7 bedroom suites and 7.5 baths. The grounds boast a custom stone salt water pool and spa, covered pavilion, barbecue center and manicured lawns. All with privacy! Other amenities include a four car garage, spiral staircase, specialty ceilings throughout, walnut distressed floors and much more! Tremendous value!" "This sprawling updated one-story ranch home overlooking serene North Ranch will literally take your breath away with its unobstructed views of rolling hillsides and expansive skies. This estate has all you could desire with a new gourmet kitchen, upscale touches, high-tech upgrades, and an exceptional private entertainer's backyard." "Only a minute walk from the lake! Great floor plan with a very comfortable and charming feeling. Beautiful cherry wood floors all redone with an espresso colored stain throughout the downstairs. Formal living room with marble fireplace and dining room that opens to butler's pantry. Gourmet kitchen with Viking stove range and hood, walk-in pantry, stunning granite counters, Subzero refrigerator, breakfast nook, kitchen island with bar seating, and opens to family room. Huge family room with tons of light, built-ins, fireplace, and sliders to the backyard. 5 bedrooms total, 4 upstairs and a Office/Den/Bedroom down, 2 bedrooms share a great Jack & Jill bathroom. Master suite with sitting room, fireplace, his/hers walk-in closets, plus bathroom with steam shower and spa tub. Picturesque backyard with a huge gorgeous Oak tree, fruit and veggie garden & a BBQ Island with Quartzite countertop, firepit and fountain. Huge and rare 4 Car garage. Double lot over 1/2 ac! No HOA on this one...WOW!" "Come home to this exquisite estate on a corner lot in North Ranch in quiet prestigious neighborhood proximal to country club greens, award-winning schools, hiking trails, shopping and restaurants. The residence features 6 Br 9 Ba and 6,784 SF of luxury living space on a 20,038 SF lot with cobblestone circular drive. Lower level includes open living room; formal dining room; large-island kitchen with prep sink, Sub-Zero and Thermador SS appliances, warming drawers, two dishwashers, and walk-in pantry; family room with custom wood walls, coffered ceilings, fireplace and bar; second master suite with custom walk-in closet with wood walls and coffered ceilings; 2 bedrooms with ensuite baths, one with private garden and entrance. A spiral staircase leads to a master retreat with soothing mountain views, expansive walk-in closet with built-ins, fireplace, sitting area, his/hers separate baths, and private balcony. The second floor also has 2 large bedrooms with ensuite baths and walk-in closets and bonus room. Hardwood floors, custom woodwork and built-in sound system and intercom throughout. An entertainer's yard offers extreme privacy, a covered porch with varnished wood flooring, built-in BBQ center, rose garden and a sparkling clover-shaped pool with spa." "Highly Desirable, North Ranch Single-Story Mediterranean Estate with Spectacular Mountain Views. At the end of a quiet cul-de-sac behind private gates, this picturesque 1.08-acre property is surrounded by lush landscape with a magnificent backyard and gorgeous views, backing to a natural creek and mature Oak Trees. This warm and inviting sunny home offers vaulted ceilings, elegant travertine and wood flooring, all en suite bedrooms, 3 custom fireplaces, spacious, natural light-infused living areas along with several versatile spaces, including separate office/study, second lounge area, and media room with beautiful custom woodwork, barrel ceilings, wet bar and extensive balcony capturing more views. The outside living space is truly fantastic, and accessible through numerous French doors! Dine, relax, entertain - do it all in a sublime setting complete with an enormous back patio, pebble finished pool & spa with waterfall, oversized decking, covered built-in BBQ/outdoor kitchen and an exquisitely framed cabana with pool-side bathroom and is a striking backdrop to the pool terrace. A well-designed, rare single-story floor plan, gated and private, surrounded by lovely palm trees and stunning views; this beautiful estate offers California living at its best!" "Astounding quality nestled in a mature treed setting in prestigious Westlake Trails. Artistic iron gates open to a 7,758 sq ft Country French estate of 7-bedrooms, 8-baths in secluded tranquility. The luxurious property includes an opulent Guest House: patio, balcony, full kitchen, fireplace, large bath, spacious living areas & 270 of mountain & valley views. Enter the Main House via a beveled glass atrium foyer where you'll be immersed in build quality details that will surpass the expectations of even the most sophisticated buyer: Enkeboll moldings, 6 Enkeboll fireplaces with Italian marble, vaulted beam ceilings, extensive beveled glass & elegant hardwood floors. Kitchen fit for a Family Chef: carved granite counters, large cooktop island, 3 ovens, 2 built-in refrigerators - all opening to the Family Room. Gather yours at the breakfast bar or by the fireplace, TV, French doors, wet bar or 12 ft laddered library. Master is spacious & complete with sitting area, fireplace, & storage cabinetry. The exquisite spa bath has his & her vanities, marble floor & jet tub. Entertain? Try the lavish Great Room: screening area, large carved wood wet bar, fireplace & balcony; or, choose the secluded backyard - BBQ grill dining, pool & spa, perfect for SoCal nights." "IF ONLY I could find a gorgeous Westlake Island home that doesn't need a 2 year remodel costing a mountain of money, with a picture-perfect location... Oh yes, and a pool and spa would be very nice..... WHAT! It just came on the market?? I need to see this NOW! Beautifully remodeled with large open floor plan. dream kitchen with all the ''toys'' and huge island. Separate formal living room overlooking the pool and the lake, and separate formal dining room. Generous master bedroom suite with soothing lake view, walk-in closets, perfect master bath. Two additional bedrooms upstairs plus a charming secondary bedroom downstairs. Watch the fascinating wildlife on the lake from your covered patio. Swans, egrets, ducks, geese and especially the turtles sunning themselves on the rocks just off your shore. Convenient U-Shaped boat dock. All this on a 24-hour guard gated island in the heart of Westlake Village. Could anything be more wonderful than this?" "Reminiscent of the glamour of old Hollywood, this Spanish colonial estate is privately gated at the end of a long driveway. Smooth stucco exterior, low pitched Spanish tile roof, arched and Palladian windows are just some of the distinctive exterior features. Recently re-imagined and renovated with Italian wood-like porcelain tile throughout much of the downstairs, new lighting, dry-stack fireplaces and more. Dramatic lofty ceilings, natural light and arched openings in the entry and living room. Kitchen is perfect for the home chef, and includes a butcher block island, stainless appliances, banquette seating and views to the hills beyond. Dining area is between the kitchen and spacious family room. Temperature controlled 1400 bottle wine cellar is adjacent to the dining area. The owner's suite is secluded upstairs with secondary bedrooms downstairs. The resort like backyard is perfect for entertaining with covered cabana, outdoor kitchen, fire-pit with built-in seating, newly renovated salt water Pebble-Tec pool/spa with baja shelf, zero edge, and waterfalls." "Prime Mediterranean estate with an ideal private location in guard gated North Ranch Country Club Estates. Tremendous value for this great location and sensational floor plan! Interior features include a dramatic two story marble entry. There is also a huge center island kitchen that opens to a massive family room with an abundance of french doors. The master suite boasts a fireplace, balcony and sauna. There are also wonderful open space views. The grounds provide a pool and spa, mature landscape and more. Other amenities include a four car garage. A truly fantastic opportunity!" "Breathtaking elegance surrounds this beautiful Mediterranean home in one of the most desired streets in North Ranch. Upon entrance through the custom, hand-made, steel/glass entry door you will feel like having stepped into Dwell Magazine, your home has been completely remodeled & upgraded with designer elegance throughout. Features & styling include solid, wide-plank oak, curated Art Deco, updated Spanish-style designer imported tile, curated hardware & plumbing fixtures all throughout. The well designed open floor plan with soaring 14 wood beamed ceilings is captivated by a warm sense of natural light offering two dual large living rooms, a dramatic, custom glass wine tower, new wall of folding doors to patio & pool perfect for outdoor living and entertaining. The top-of-line gourmet dream kitchen with Thermador appliances, Quartz countertops, custom cabinetry and homey dining area really delights the soul & excites the senses. Enjoy six large bedrooms, four of which are en suite with two being down stairs. The huge private master offers everything you could imagine, Restoration Hardware vanities, quartz tops, curated designer lighting, custom walk in closets, fire place, soaking tub, stunning walk in shower and private balcony. Other features include a office with balcony, built in sauna, large storage room, circular driveway. Enjoy the salt water pool & spa with a private outdoor bathroom & kitchen/BBQ. The mature landscaping includes various fruit trees & lush plants."